The lines of the new Mondeo are rather nice. It disguises its length with a curvaceous front end, and features some bold swoosh lines down the side. The Vignale trim adds flashes of chrome all around, from the grille and fog light surrounds at the front, to some side bump strips and window surrounds. Chrome dual exhausts complete the exterior package. Finished in Magnetic my test car looked superb, and there are three exclusive colours available- Ruby Red, Milano Grigio and White Platinum- should you wish to stand out from a crowd. I’m not completely sold on the polished alloy wheels, but these are an optional extra so if they don’t tickle your fancy you can leave the box unticked. 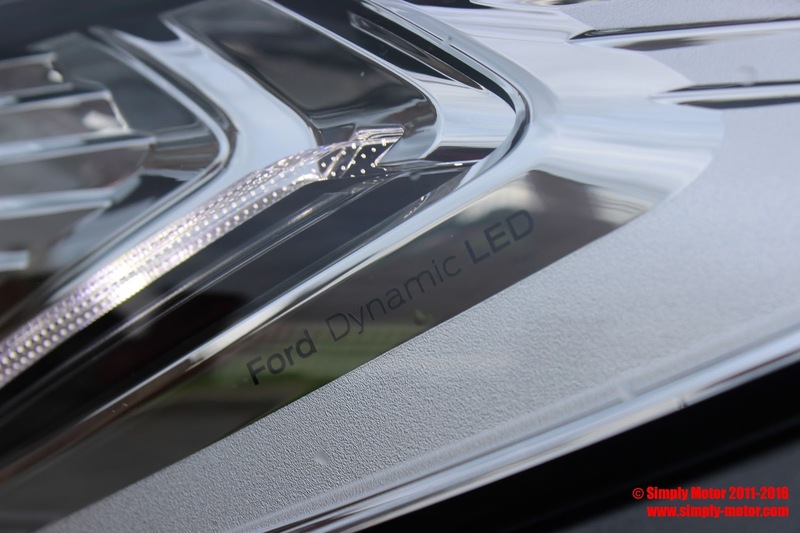 Inside the Vignale is noticeably more premium than other Mondeo’s. The first thing that will grab your attention is the trim. 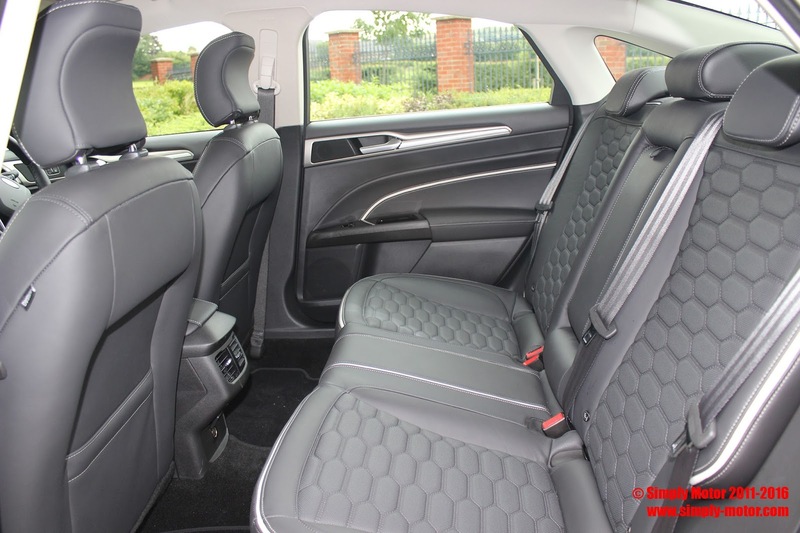 The seats are finished in a premium leather, with a contrast border, perforation and hexagonal pattern. Look a little closer and you will notice that the dashboard is also leather, which is a really nice touch. The dials are a pair of TFT displays, which are crisp and clear for the driver. Nestled into the centre of the dashboard is an 8-inch touchscreen which features the brilliant SYNC 2 system, and the dashboard features plenty of silver trim to contrast the black leather. It feels airy and light, and is a welcoming space. There are numerous drivetrains available on the Vignale, but my test car came with the one that is the most interesting. It’s a 2.0-litre diesel engine producing 180PS and 400Nm of torque. Now I know that may not seem that interesting, but bear with me. You see this Vignale was AWD and featured a Powershift automatic gearbox. 0-62mph is dealt with in 8.6 seconds and the top speed is 138mph. That makes the Vignale relatively brisk, but it’s not about that. The Powershift transmission is remarkable; gear changes are instant but don’t break your neck. Motorway cruising is a delight, with the torque available should you need some overtaking grunt. The AWD system is a revelation on the Vignale, and frankly I’m surprised it’s taken Ford this long to offer it on a Mondeo considering the success of Audi’s Quattro system for many years. Despite only having 180PS the Vignale can use all of this, all the time. It just grips and grips. The steering is direct and nicely weighted, whilst the ride is a nice balance of comfort and composure. This isn’t a car to be hooning down a country lane, but you could. Even in the wet. The down side to this is it highlights that there should be a Mondeo ST. This chassis is crying out for an engine to match… come on Ford! The diesel engine comes with start stop technology in a bid to improve fuel consumption and reduce emissions. The Powershift gearbox is also optimised to improve efficiency, and as a result the Vignale returns 53.3mpg on a combined cycle. CO2 emissions are 138g/km putting the Vignale in VED band E. Road tax is £130 in the first and subsequent years, which is not too bad for a large, AWD executive saloon. There is also a hybrid version available with CO2 emissions of 99g/km if you want something a little more economical, but I think the diesel is a happy medium. There are certain qualities you would expect from a Mondeo; big boot, specious cabin and easy to live with. The Vignale ticks all those boxes and then some. The cabin can seat 5 adults, and tall people are fine in the back. The boot is large, but has a restricted opening due to being a saloon. There is an estate version available for those with dogs or more significant haulage requirements. To live with the Vignale is fantastic. From the wonderful SYNC 2 system, to the adaptive lighting, keyless entry and go, rear-view camera and lane keeping aid; the Vignale has it all. There is even a system called Active Noise Control, which emits specific sound waves into the cabin to drown out noises such as engine, transmission or wind. This is a car that doubles as a pair of noise cancelling headphones, allowing you to enjoy the sound from the Sony stereo. I like that. So that concludes my time with the Mondeo Vignale. On paper I wasn’t sure if it would have a point; I wasn’t entirely convinced a luxurious Mondeo would make much sense. However after spending some time with it I get it. It looks good, drives great, and even as tested costs £33,645. That’s rather good value, and for that you’re getting the staple car that has become synonymous of Ford. If you are thinking about buying an executive saloon, then I might just urge you to think twice before signing up for a BMW 320d. Head over to the Ford website or visit a local dealer. Take a look at the Vignale, and do as the adverts say: unlearn. Mondeo Man has put his tuxedo on.